We believe in “play and learn” and so we have different educational toys and games for the kids to learn and enjoy. Our goal is to bring entertainment as well as enhancing concentration, skill levels and challenging the minds of children. 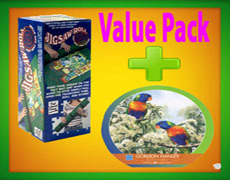 Shop and save when you Buy Jigsaw Puzzles Online. We stock one of Australia’s largest range with thousands to select from. We cater all price ranges from Cheap Jigsaw Puzzles through to all the major leading brands such as Ravensburger, Educa, Blue Opal, Heye, Clementoni, Holdson, Jumbo, Crown & Andrews to name a few of the Quality Puzzle manufactures. We continue to grow our extensive range each day by sourcing unique new products, making Game Oz one of the Leading Jigsaw Puzzle shops in Australia. Make sure to check back regularly or sign up for our newsletter to find out about new arrivals and to take advantage of exclusive promotions, toy specials, clearance items or that next discount Jigsaw Puzzles for sale. You are sure to enjoy spending hours browsing through the myriad of Jigsaw Puzzles, Games and Toys.